Learn Spanish in Tranquil Cuenca . . .
Cuenca is a historic and tranquil colonial city in the south of Ecuador appreciated for its benign climate and traditional lifestyle. It shares with Quito the distinction of having a particularly clear accent, making it easy for students to learn to communicate with their teachers and with the local population. The Spanish school is set in a beautiful historic building in the heart of the historic district of Cuenca, only two blocks from the main Parque Calderón and the cathedral, and close to all the main attractions. There are a wealth of extra activities on offer - free salsa classes, cooking classes, and regular excursions around the city during the afternoon and evenings. As in Quito, students arriving on their own will quickly find like-minded travelers to explore the city and its surroundings. At weekends we offer day trips outside Cuenca to some of the spectacular locations, from the Inca ruins of Ingapirca to Cajas National Park. Students are welcome to split their study time between our Spanish schools in Quito and in Cuenca. That way you can get to experience both these magical cities while you work on improving your Spanish! "In my two months I had a great time. The education was top notch. 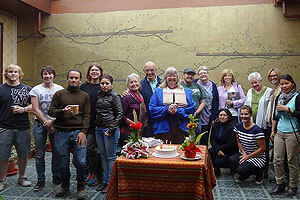 Yanapuma has great instructors and tons of opportunities to dig into the life of Ecuador. I liked the fact that tourism and volunteer opportunities were integrated into the life of the school. It served as a good, safe base for anything we wanted to explore. Excellent!" Click on the links above right to learn more about the Spanish programs on offer.